1. 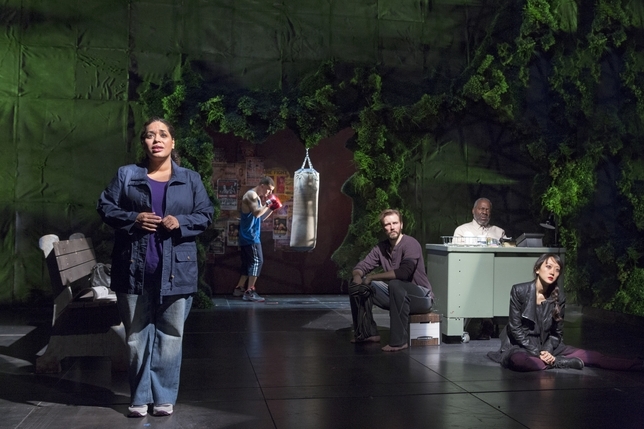 It is the first Pulitzer Prize-winning play by a Latina playwright. And boy does Quiara Alegría Hudes represent. Water by the Spoonful follows ex-Marine Elliot and his return home to Philadelphia. While Elliot’s postwar demons are not new, the perspective of a Latino veteran is. The same could be said for Elliot’s cousin Yaz, who is reevaluating her life after her divorce. Her relationship with her husband was strained in part because it was an interracial one. Odessa, Elliot’s biological mother, has a particularly poignant arc. While her addiction to cocaine would usually be the end of the story, in Spoonful it’s only the beginning as Odessa uses her experiences to moderate a forum about substance abuse. Add in a group of diverse well-rounded supporting characters and you have Water by the Spoonful. 2. Internet conversations can still be dramatic ones. At first, I couldn’t believe that entire scenes were taking place in Odessa’s internet chat room. But this production of Spoonful deftly handled these scenes, in part by displaying the avatars and usernames of the characters on stage. And with so much of our communication now taking place online, it was a bold and timely move to include the online interactions of the characters. I mentioned this in my Stephen Adly Guirgis post, but I love plays that take us somewhere beyond the living room. Spoonful travels to a Subway in Philly, a train station in Japan, a rainforest in Puerto Rico, and more. Seeing all of these places on stage was not only exciting but also allowed characters to go on new and unexpected journeys. I especially liked Madeleine’s quest to find herself in Japan, and Elliot and Yaz’s spreading their aunt’s ashes in El Yunque. A lot of today’s theatre has to do with aloof-ness and disassociation, whether it be through emotion-less line readings or snarky witticisms. But Water by the Spoonful‘s characters aren’t afraid to care. Yaz is passionate about teaching Coltrane to her students and take care of Elliot, Odessa wants the best for all of her forum members, and Madeleine wants to connect to Clayton in a tangible way. Hudes’ honest writing and the ensemble’s sincere performances create a memorable, heartfelt night of theatre.